In Howard Gardner’s Frames of Mind, he proposes that there are seven main areas in which all people have special skills; he calls them intelligences. His research at Harvard University was in response to the work that Alfred Binet had done in France around 1900. Binet’s work led to the formation of an intelligence test; we are all familiar with the “intelligence quotient,” or “IQ,” the way that intelligence is measured on his test. This type of IQ test was used as the basis of another one with which most of us are familiar: the Scholastic Aptitude Test (SAT), which is taken my most college-bound high school students. Both of these tests look predominantly at two types of intelligences: verbal and math. If a person does well on these, s/he is considered “intelligent,” and is a candidate for one of the better colleges or universities. But what about everyone else? How many of you who are reading these words have used the phrase “not good at taking tests,” when talking either about yourself or your child? 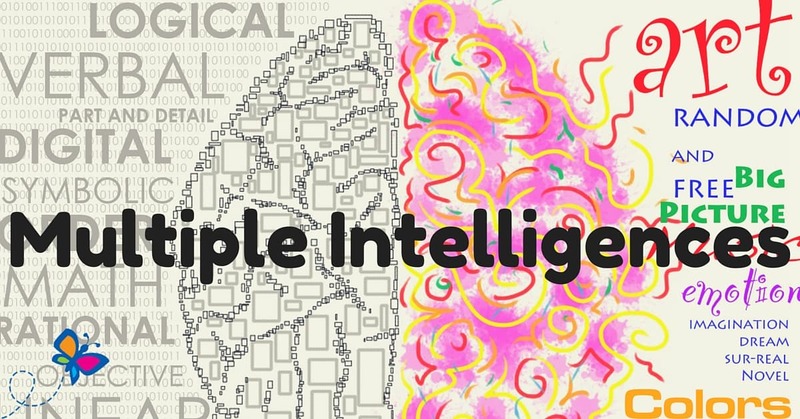 The Multiple Intelligences (MI) theory proposes that there are other measures of intelligence beside these two. I offer this information to you so that you can understand that while many teachers have some knowledge of MI theory, most of our schools are not fully set up to use it to the advantage of all students. That being the case, perhaps you can either (1) be involved in helping your child’s teachers and school to provide a more balanced program that develops his intelligences that are not more included in the curriculum or (2) find activities outside of the school environment in which your child can develop his dominant areas of intelligence. You should also know that MI theory posits that each of us has, to some degree or another, all of these intelligences. Some of them are simply more developed than others. Furthermore, we are all able to improve our ability in each of these areas. Bodily-kinesthetic: using one’s body to solve problems and express ideas and feelings. Actors, athletes, and dancers use their whole bodies in this way, much the same way that craftspeople, sculptors, and mechanics use their hands. Do you regularly participate in a sport or some physical activity? Is it difficult to sit still for long periods of time? Do you enjoy working with your hands in creating things? Do you find that ideas and solutions to problems come to you while you are exercising or doing some sort of physical activity? Do you enjoy spending your free time outdoors? Do you speak with your hands or other body gestures? Do you learn more about things by touching them? Do you enjoy thrilling amusement park rides such as the roller coaster and other activities like this? Do you think of yourself as being well-coordinated? In order to learn a new skill, do you have to practice it to learn it, rather than read about it or see it in a video? excel in more than one sport? move various body parts when required to sit still for long periods of time? have the ability to mimic others’ body movements? enjoy taking things apart and putting them back together? have a hard time keeping hands off objects? enjoy running, jumping, or other physical activities? show skill in activities that require fine-motor coordination, such as origami, making paper airplanes, building models, finger-painting, clay, or knitting? use his body well to express himself? Interpersonal: perceiving the moods, feelings, and needs of others. It includes salespeople, teachers, counselors, and those we have come to call the helping professions. Have people always come to you for advice? Have you always preferred group sports to solo sports? Do you usually prefer talking to other people about a problem, rather than figure it out on your own? Do you have at least three close friends? Do you prefer social activities over individual pursuits? Do you enjoy teaching others what you can do well? Are you considered to be a leader, either by yourself or others? Do you feel comfortable in a crowd? Do you prefer to spend your time with others than alone? seem to be a natural leader? empathize easily with others, which leads to his give advice to friends who come to him with problems? enjoy teaching other kids – either peers or younger ones? have two or more close friends? serve as a magnet for social activities with others? Intrapersonal: turning inward with a well-developed self-knowledge and using it successfully to navigate oneself through the world. Do you regularly spend time alone meditating, reflecting, or thinking about important life questions? Have you attended counseling sessions or personal growth seminars to learn more about yourself? Do you have a hobby or interest that you keep to yourself? Have you set goals for yourself regularly? Do you have a realistic view of your strengths and weaknesses? Would you prefer spending time by yourself rather than with many people around you? Do you keep a diary or journal to record the events of your inner life? Are you either self-employed or have you given serious consideration to starting your own business? show a sense or independence or a strong will? have a realistic sense of her abilities and weaknesses? do well when left alone to play or study? “march to the beat of a different drummer” in living and learning? have a hobby or interest she doesn’t talk about much? have a good sense of self-direction? prefer working alone to working with others? accurately express how he is feeling? learn from failures and successes? Linguistic: using words, either orally or written, in an effective manner. This intelligence is associated with storytellers, politicians, comedians, and writers. Have you always enjoyed books and given them importance? Do you hear words in your head before you speak or write them? Do you enjoy talk shows more than television or movies? Do you enjoy word games, puns, rhymes, tongue-twisters, and poetry? Do you have a highly developed vocabulary and enjoy knowing words that other people do not know? In your own education, did you enjoy subjects related to words and ideas, such as English and social studies, more than math and science? Have you enjoyed learning to read or speak other languages? In your speech, do you refer to information that you have read or heard about? Have you been praised, recognized, or paid for your writing? write better than average for her age? enjoy telling stories and jokes? have a good memory for names, places, dates, and other information? enjoy word games, either visually or auditorally? spell better than other children the same age? appreciate rhymes, puns, tongue twisters? enjoy books on tape without needing to see the book itself? enjoy hearing stories without seeing the book? have an excellent vocabulary for his age? communicate thoughts, feelings, and ideas well? Logical-Mathematical: understanding and using numbers effectively, as well as having good powers to reason well. Exemplars are mathematicians, scientists, computer programmers, and accountants. Have you always done math in your head easily? When you were in school, were math and/or science your best subjects? Do you enjoy playing games that require logical thinking? Do you set up experiments to see “what if” in your course of jobs around the house or at work? Do you look for logical sequences and patterns, with the belief that almost everything has a logical explanation? Do you read science periodicals or keep track of the latest scientific developments? Do you like finding logical flaws in things that people say and do? Do you feel the need to have things measured, categorized, analyzed, or quantified in some way? I think in clear, abstract, wordless, imageless concepts. demonstrate curiosity about how things work? enjoy math and/or computer games? play and enjoy strategy games such as chess and checkers, brain teasers, or logic puzzles? easily put things into categories? like to do experiments, either at school when assigned or on her own? show an interest in visiting natural history or discovery-type museums and exhibits? Musical: relating in a wide range of ways to music. This can take many forms, as a performer, composer, critic, and music-lover. Do you have a pleasant singing voice? Can you tell when a musician plays a note off-key? Was it easy for you to learn to play a musical instrument? Do you think your life would not be as rewarding without music? Do you usually have music going through your mind? Can you keep time to music? Do you know the tunes to many different songs or musical selections? Can you usually sing back a melody accurately after you hear a new selection only once or twice? tell you when she recognizes that music is off-key? easily remember song melodies and sing them? have a pleasant singing voice, either alone or in a chorus? speak or move in a rhythmical way? hum or whistle to himself? tap on the tabletop or desktop while working? show sensitivity to noises in the environment? respond emotionally to music she hears? Naturalist Intelligence: excellent at recognizing and classifying both the animal and plant kingdoms, as well as showing understanding of natural phenomena. Do you belong to a volunteer group related to nature? Do you enjoy having animals around the house? Are you involved in a hobby that involves nature, such as bird watching? Can you easily tell the differences among species of flora and fauna? Do you read books or magazines, or watch television shows or movies that feature nature? On vacation, do you prefer natural settings to cultural attractions? Do you enjoy visiting zoos, aquariums, or other places where the natural world is studied? Do you enjoy working in your garden? talk about favorite pets or preferred natural spots? enjoy nature preserves, the zoo, or natural history museum? like to play in water? hang around the pet in school or at home? enjoy studying environment, nature, plants, and animals? speak out about animal rights and earth preservation? collect bugs, flowers, leaves, or other natural things to show to others? Spatial: perceiving the visual-spatial world in an accurate way, so as to be able to work in it effectively. The people who do this cover a wide range of fields that, upon first glance, do not seem to have much in common. Compare, for example, hunters, sailors, engineers, inventors, and surgeons to interior decorators, architects, painters, and sculptors. Have you always been able to reproduce clear images in your mind, even when your eyes are closed or the objects are not in front of you? Are you sensitive to color? Do you take a lot of photographs or home movies? Do you enjoy jigsaw and other visual puzzles? Do you usually have an easy time getting around, even if it’s your first time in a new place? Do you enjoy drawing or doodling? Was geometry easier for you than algebra? Do you have an easy time reading maps and translating their information into reality? Do you enjoy books and magazines with many illustrations, photos, and design elements? recall visual details in objects? have an easy time learning to read and understand maps and charts in books? demonstrate ability in using art materials and creating drawings, sculptures, or other three-dimensional objects? enjoy visual presentations such as videos, television, and movies? get a lot of information from illustrations in books she reads? scribble, doodle, or draw on all available surfaces? I have seen limited reference to another intelligence: Naturalist, which is described as being able to recognize plant or animal species in the environment. This one is not included in the two Gardner books I list it here for your perusal, but it was added after this original research. Howard Gardner’s books on this topic are Frames of Mind and Multiple Intelligences: The Theory in Practice and Multiple Intelligences: New Horizons in Theory and Practice. In addition, Thomas Armstrong continues the work in his Multiple Intelligences in the Classroom. To get a sense of your child’s areas of strength, go to www.familyeducation.com, where you can find a page entitled Test Your Child’s Talents, which is based on Armstrong’s book. This article is reprinted with the author’s permission.